Mark Twain’s words, begun in the last post, tell how The Prince and the Pauper began as a small story and escaped his control to become a novel . 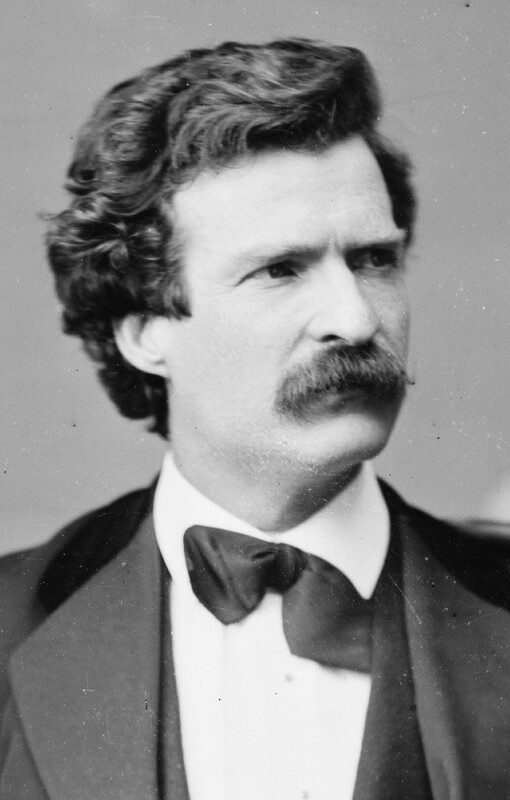 . .
Don’t misunderstand me – I have no pretensions to rank with Mark Twain, but I do understand what it means to have a story stand up on its hind legs and fight back. I have boxes full of unpublishable manuscript created when I tried to go east while my story demanded to go west. Some good writing ended up on the cutting room floor, and I will share a bit of it in later posts. Meanwhile, the rest of Mark Twain’s story of Pudd’nhead and the Twins is too funny to leave hanging, and too long to share here. Come back next post and I’ll tell you where to find the full version. For free. This entry was posted in A Writing Life on September 30, 2015 by sydlogsdon. Most science fiction readers want to be writers. They mine blogs like this for inside information. Fair enough; here’s the straight story from the old master, Mark Twain, presented over two posts with a third post to tell you where to get the rest of this little known gem, along with thousands of other free works to download. “A man who is not born with the novel-writing gift has a troublesome time of it when he tries to build a novel. I know this from experience. He has no clear idea of his story; in fact he has no story. He merely has some people in his mind, and an incident or two, also a locality . He knows these people, he knows the selected locality, and he trusts that he can plunge those people into those incidents with interesting results. So he goes to work. To write a novel? No? – that is a thought which comes later; in the beginning he is only proposing to tell a little tale; a very little tale; a six-page tale. But as it is a tale which he is not acquainted with, and can only find out what it is by listening as it goes along telling itself, it is more than apt to go on and on and on till it spreads itself into a book. I know about this, because it has happened to me so many times. More follows in the next post. This entry was posted in A Writing Life on September 29, 2015 by sydlogsdon. A few months ago I was using the satellite view on Google maps to look at the place I live now, when I realized I could look in on the farm where I grew up. I typed in ***, Oklahoma and navigated the few miles out of town. I could give you directions, but I’m not going to. The house is still there, but it has a new roof, and it looks like the owners have expanded. What used to be farmland and pasture is growing a crop of houses, so the outbuildings surrounding my old home have no more reason to exist. The round granary that I built from a kit with the help of a hired hand when I was a teenager is still there, but rusted badly. The machine shed my dad and I rebuilt after a tornado took out the original is still there, too. I remember carrying ten foot recycled railroad ties on my shoulder to build that shed when I was about fifteen. It was good to be big, young, and strong. A year later we built a hay barn together. Now, the dairy barn where I spent my childhood is rubble, and there are trees growing through the roof of the hay barn. I hadn’t realized how much I missed the place. The fact is, my life there was hellish in many ways. That’s all I’m going to say. I don’t whine; I write novels. But the echo of those times runs through them all. The biggest surprise of blogging is how much fun I’m having. To get you interested in my writing, I have to tell you about the life that made me a writer. The good stuff, that is. You don’t want to hear the rest, and I don’t plan to tell it. So I find that I am writing, for the first time, about all the good things that happened on the farm and in that little town, and I am enjoying it immensely. This entry was posted in A Writing Life on September 28, 2015 by sydlogsdon. Into the Storm stands alone and without apologies, but it was intended as the opening of a longer story. Here Michael and Lydia have a relationship that is set but unstable. The strength of the story comes from the tensions generated. If you want to know where all this might have gone, you will find a postscript here. Lydia spread her pinions as the pylon shivered beneath her. Dizzy with height, she swallowed back familiar bile and squeezed her eyes shut for one last moment of selfness. She ignored Michael’s voice in her head and drew on all her strength to quell the shivering of her muscles. Thunderheads piled up in the west, clouds tumbling over one another in their haste to eat up the prairie. She retreated from confrontation to a safe, quiet corner of her mind, denying self and opening her mind to Michael while he waited with leashed impatience. The pylon swaying beneath her became as a great ocean swelling. With her quietude established she whispered, “Now, Michael,” and he filled her. Spreading their wings to the coming storm, he pumped quickly twice, rising from the pylon and settling again. Accustoming himself to her body. She rode on the left shoulder of his mind, bright eyed and frightened, but ready. Her gift to him; a pledge of her love. It filled him as he filled her and the gestalt threw tremblings through their shared body. The storm was striding across the prairie, a juggernaut of cloud with lightning for eyes and skirts of rain. He spread their wings again and brought them forcibly downward. They cleared the pylon railing and fell, spreading their wings wide to catch the updraft. Upward then, with a beating of wings augmented by the rising tide of air. His mental picture – Daedalus rising with wings rooted in his flesh. Hers – a frail human suspended from synthetic wings, powered by servos and the rising wind. Two hundred meters they rose as Michael churned the air with wings meant for soaring. Then he rolled gently left and volplaned toward the city below. Even in the heat of summer he would find an updraft there. The sky was impossibly blue, the sun hot on their wings in these last moments before the storm broke. They caught the updraft and circled the city – a jumble of glass, concrete and solar collectors. She retreated from seeing, concentrating instead on the steady beat of her arms as Michael swung them through the fastest rising currents. Michael was an artist at this; he had only fallen once. He was neglecting his body. She sent her consciousness down the shivering wire of thought that bound them together, found him breathing slowly, his heart rhythm slow but steady, and returned. Cutting figure-eights against the sky above the city, Michael gained altitude, but she had almost waited too long. She sensed his impatience and shielded her memory so that he would not catch a picture of her clinging in terror to the ladder between the fourth and fifth levels while a gust shivered the pylon. Had the monitor seen her then, he would have ordered her off the tower. What would Michael think if her weakness denied him his one chance at ecstasy? He chose adjacent cells with care and dove into the well of a downdraft. They fell with wings spread just enough to catch the falling air and throw them toward the earth. Past the hail, past the lightning, and into the rain. Outspeeding the raindrops so that they smashed against her face like upward falling rain. 100 klicks, 200 klicks; speeds not to be measured on instruments; not for an artist; a master. Not for a man who had only fallen – once. He sensed their speed in the groaning of her titanium pinions and the growing strain on her arms. She closed her eyes against the pain to come. He arched their back and spread wings against their fall, arcing them upward and sideways through the turbulence of the interface and into a rising cell. The servos took the strain, but they communicated a portion of it to her. Pain, the instructor, the feedback; the pain would become unbearable before the fabric of her wings failed. Just before. They shared the pain, but pain had become his world and this was his rising above it. His exultation. And it was her gift to him that she lent her body to this, for to her the pain was only pain, and she cried out against it. Then they were climbing faster than ever, from the momentum gained in their plummet. She drew her pain in and made it a private thing that Michael could not feel. Later another, softer Michael would feel remorse for her pain. With hands and mouth, for his lower body was paralyzed, and with full knowledge that his own burning could never be satisfied, he would ravish her, putting all of his frustrations into her ecstasy. That he gave her freely, as she gave him this. That was the Michael of endless nights and bitter days; but now, for one long moment of exultation, he was the Michael that had been, before misjudgment and arrogance had hurled his body to the ground. Through the roof he called it. Augmented by the momentum gained in falling, propelled by the even beating of mechanical wings and buoyed by the rising cell of air, he took her through the rains and the lightnings and the pit-cold region where hail is born, upward through the thinning edges of the storm to where the air is still and the sun still shines. Through the roof. With the last erg of upward force expended, Michael rolled over to float above the storm. From here the thunderheads were pearly white; billowing fields and valleys of cloud as peaceful as the sleep of childhood. They looked as if a man could walk across them to the end of the world. The sky was the dark blue of high altitude and the gray ring around the sun was itself encircled by a rainbow. Hovering like some great eagle, above the tumult of the storm, with their height disguised by the carpet of clouds, her fear left her and her joy began. For long minutes they glided, and she felt Michael slipping away. His ecstasy had ended. To dive again into the storm would be foolhardy; whatever Michael’s vitality, it was Lydia’s body they rode and she had reached her limit. She felt his hesitation and knew his temptation. Just one more thrust into the clouds; just one more plunge to ecstasy and death. This entry was posted in Into the Storm on September 26, 2015 by sydlogsdon. In the beginning was the void, for there were no computers, and I wanted one badly. Then out of the void came Atari, and Tandy, and KayPro, but I couldn’t afford them. Then the Woman ate the Apple, put on her running shorts and raced through the auditorium carrying a big hammer, and Mac was born. About that same time I realized that if I kept writing full time, I was going to starve to death. I had written Spirit Deer, Jandrax, A Fond Farewell to Dying, multiple versions of Valley of the Menhir, and an early version of Cyan. I had shoved about 6000 sheets of paper through the old typewriter. I had two novels published by major publishers in America and one in Europe, and I wasn’t making enough to pay the rent. I went back for my teaching credential. I worked a year at half salary, just before that became an illegal employment practice, then I got my first full paycheck in years. My colleagues were complaining about how little teachers were paid, but I thought I was rich. After a couple of years of patching up the holes in my bank account, I finally bought a Mac SE. I may be prejudiced by first love, but I think that was the first “real” computer. The Mac graphic interface was already the ultimate game changer, and the SE was the first Mac with an internal hard drive. The practical advantages of that cannot be overstated. The computer changed everything. It didn’t make writing easy, but it made re-writing easy. I still write multiple drafts, but I only type a small fraction as many words. I correct, rearrange, tweak, amplify and delete, but I never have to retype a complete page again. And again. And again. Two things happened about the time computers took over writing. The average length of paperback novels doubled. And suddenly, everybody was writing. There has to be a connection. SPECIAL ANNOUNCEMENT. If you read A Writing Life without also following Serials, you may not realize that To Go Not Gently, the novella from Galaxy which is an excerpt from A Fond Farewell to Dying, begins today in Serials. Check it out. This entry was posted in A Writing Life on September 25, 2015 by sydlogsdon. To Go Not Gently has been moved to Backfile. This entry was posted in Serial on September 25, 2015 by sydlogsdon. In the beginning was the void, for there were no computers, and I wanted one badly. When I was in the Navy, before I had any intention of writing novels, there was a time when I thought writing non-fiction articles and books might be a good way to pick up a little side money. I began with a book on woodworking projects. I still have the prototypes I designed and built, but the book went nowhere. I did sell two articles, one on ”A Basic Toolkit for the Home,” for Woman’s Day, and one on bicycle camping to Travel and Leisure. Those were good days. Writing was a joy and selling had not yet turned sour. My cat China Blue spent his time draped around my shoulders. Leonard Cohen, on vinyl, kept my mood carefully balanced between ecstasy and depression, as only he can. I had a head full of characters, images, and ideas, and time to write them. Unfortunately, my fingers spent most of their time arguing about who was going to go first, which doesn’t make for smooth typing. In high school typing class I used to brag that my speed was sixty mistakes a minute. There are so many conceptual and artistic errors in any first draft that fumble-fingered typing is not a real issue. Eventually, however, you get to the final draft. I couldn’t afford a professional typist and the correction technology of the day was crude. My TYPEWRITER had a function that allowed me to BACKSPACE and shift to a white RIBBON which would OVERSTRIKE the previous letter, if the paper had not shifted on the PLATEN. If you recognize those words, you are of my generation and you have my sympathy. I didn’t just want a computer, I needed one. This entry was posted in A Writing Life on September 24, 2015 by sydlogsdon.